Little Earth watches with amazement as NASA astronaut Anne McClain tries on her spacesuit for a fit check. 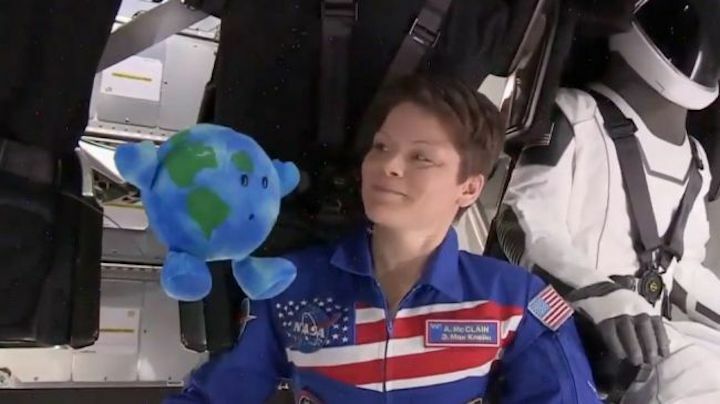 It was love at first sight when NASA astronaut Anne McClain opened the hatch on SpaceX's Crew Dragon spacecraft and met her adorable new roommate. 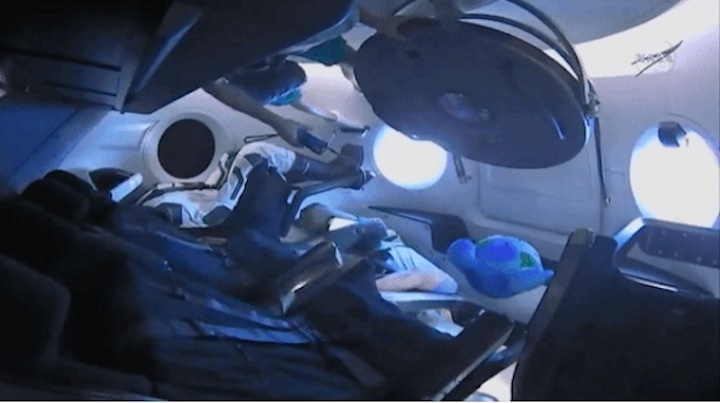 Inside the Crew Dragon was a small Earth plushy — a toy made by a company called Celestial Buddies — that SpaceX employed as a "super high tech zero-g indicator" for the spacecraft's historic first trip to space. With big, beady eyes and a mouth that's constantly agape, the Celestial Buddy looked perpetually amazed as it launched into space, floated around the capsule in microgravity and arrived at the International Space Station to meet the Expedition 58 crew. 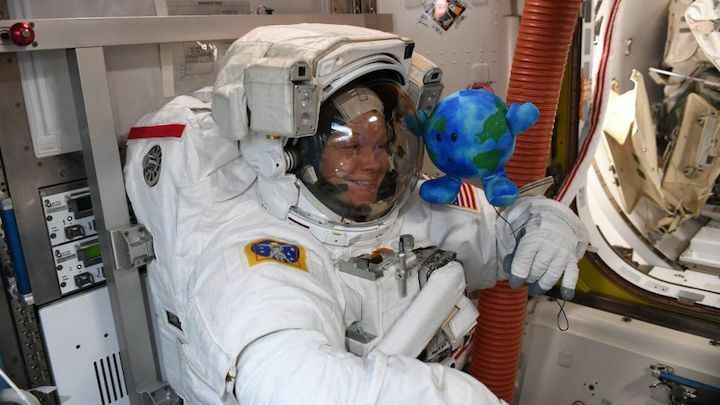 While inspecting the SpaceX Crew Dragon after it docked at the International Space Station on March 3, 2019, Canadian Space Agency astronaut David Saint-Jacques bumps into the Celestial Buddies Earth plushy and sends it tumbling around the inside of the capsule. The first space-station crewmembers to greet the little Earth (and its co-passenger, a spacesuit-donning dummy named Ripley) were astronaut David Saint-Jacques of the Canadian Space Agency and Russian cosmonaut Oleg Kononenko. The two entered the capsule wearing gas masks and carrying instruments to test the atmosphere inside the capsule. Once the spacecraft was deemed safe, the astronauts held a welcoming ceremony in which they showed off the newly docked Crew Dragon spacecraft during a live broadcast on NASA TV. McClain led viewers on a tour of the Dragon's interior while simultaneously exchanging "googly eyes" with the little stuffed planet. From then on, McClain and the little Earth became practically inseparable. Not only has McClain been tweeting adorable photos of her new friend, but she actually tethered it to her body with a short leash to keep it by her side during live video interviews on NASA TV. On their first day together, they went to the Cupola window to gaze at Earth (the actual planet) and admire how beautiful it looks from orbit. Then little Earth kept McClain company while she tried on the spacesuit she'll be wearing for two spacewalks later this month. "Earth will learn a lot during his busy week on @Space_Station," McClain tweeted. By day two they were sipping space coffee through a straw together and conducting some routine drills and maintenance work around the orbiting lab. 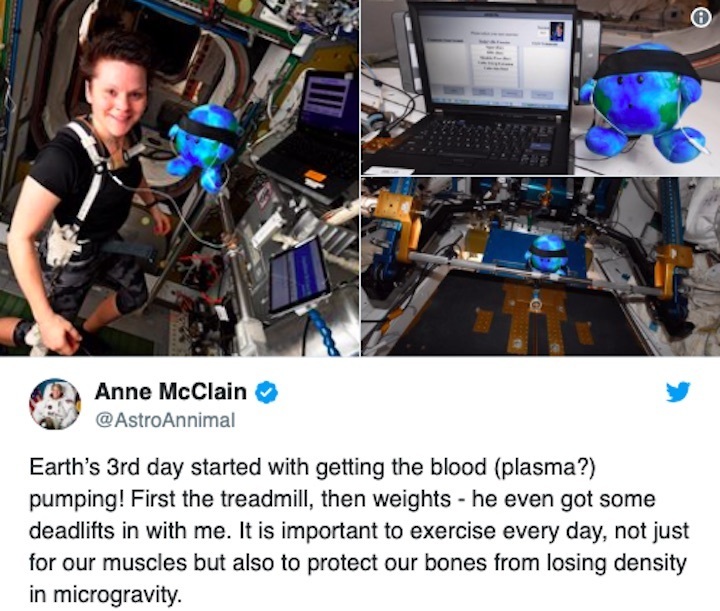 On day three the cosmic pals hit the "zero-g" gym together to jog on the treadmill and lift weights using the space station's Advanced Resistive Exercise Device (ARED), a machine that simulates the resistance of weights in microgravity. The little Earth might not have the muscles (or opposable thumbs) required to do a deadlift on the ARED, but he sure looked the part with his sweatband and earbuds. McClain and her little round friend sure look like they're having fun together in space — but as the old saying goes, "all good things must come to an end." When the Crew Dragon undocks and returns to Earth this Friday (March 8), the Earth plushy will come along with it. But the little Earth's historic journey will not be over after McClain and her crew bid it farewell. Together with Ripley, the dummy on board, it will get to experience the first-ever splashdown of a Crew Dragon. A camera inside the capsule will provide live views of both passengers, and that footage will help SpaceX determine how smooth the ride is. SpaceX has not yet announced its plans for the little Earth once it returns to (the bigger) planet Earth.